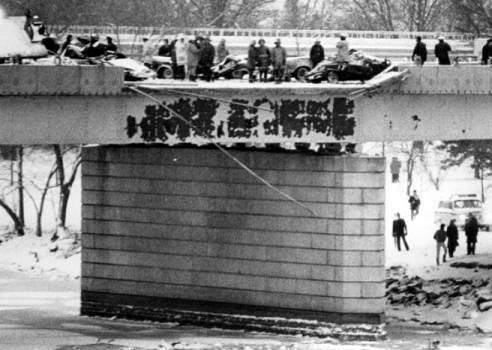 January 13, 1982 - Washington D.C. - Air Florida, B-737 crashed into the 14th Street bridge and into the Potomac River on takeoff from Washington National Airport. Despite heavy snow and frigid temperatures, the crew failed to activate the engine anti-ice systems, causing the engine instruments to display erroneously high thrust readings during takeoff and, as a result, the crew attempted to take off using only 71% thrust. The NTSB found errors in the way the plane was de-iced -- the crew even tried to reduce the build-up on the B-737 by using the exhaust of a jet in front of them. 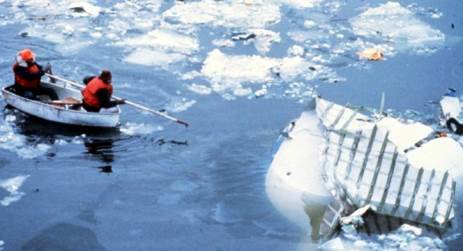 That decision may have only worsened potential icing on the wings. 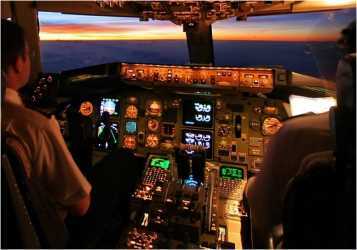 Ice covered critical engine probes gave the pilots a false reading of the thrust needed for takeoff. It was also determined that communication and management problems needed to be addressed as older military pilots still believed that captains were always right and did not need advice. 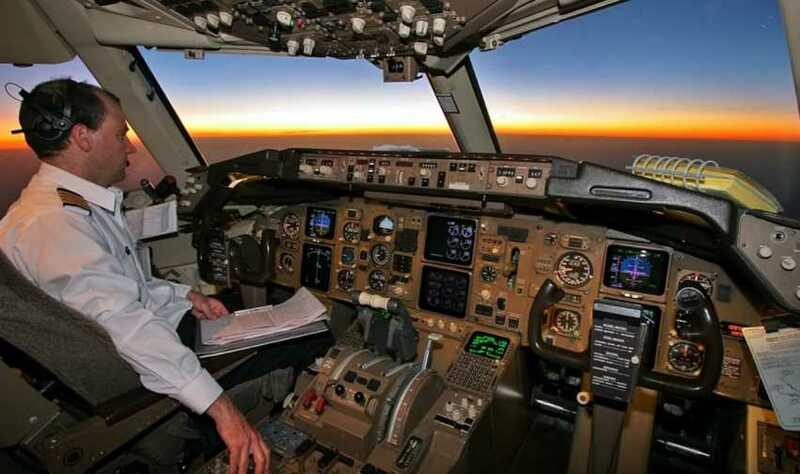 The copilot had pointed out to the captain that the engine instrument readings weren't right with the throttle position, but the captain ignored this advice. 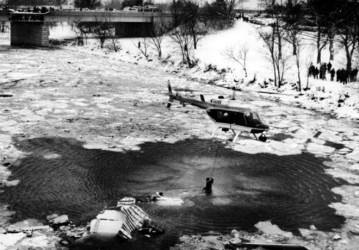 The investigators also said that the Florida flight crew did not have much experience with winter weather, and sat on the taxiway too long while snow and ice fouled the critical leading edge of the wings and reduced the jet's lift as it traveled down a runway that ended at the Potomac River. 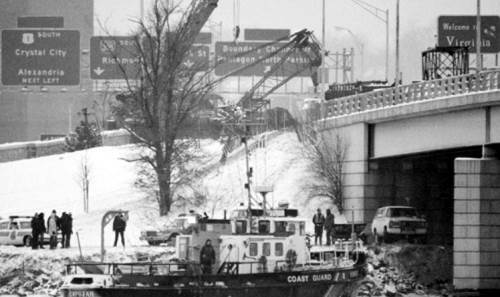 The 140-page (.pdf format) NTSB Accident Report is available on the Internet. January, 1982 - FAA Administrator J. Lynn Helms introduced a 450-page document called "The National Airspace System Plan" (NAS). 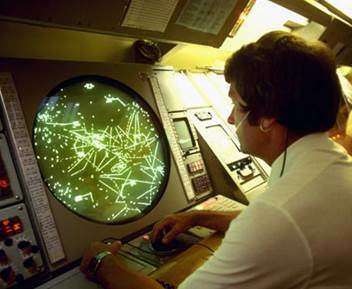 Highlights included new levels of automation for en route and terminal portions of Air Traffic Control, the implementation of a new generation of secondary radar (Model-S transponder), procurement of MLS and other advanced landing aids, and solid-state communications and navigation technology, consolidation of centers and TRACONs and the modernization of FAA's Flight Service Stations. One of the first items on the agenda was replacing the 1960s-vintage IBM 9020 Computers with new 'HOST' computers capable of handling 9020 software with only a few alterations. 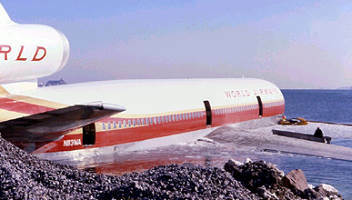 January 23, 1982 - Boston, MA - World Airways, DC-10 arriving at Boston's Logan International Airport landed long, and due to the icy runway surface, the airplane was unable to stop. 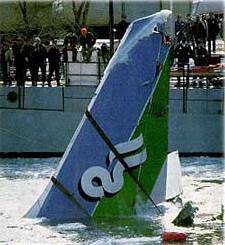 The DC-10 cockpit and forward galley were separated from the main body of the aircraft, and the first row of passengers seats were thrown into the water. 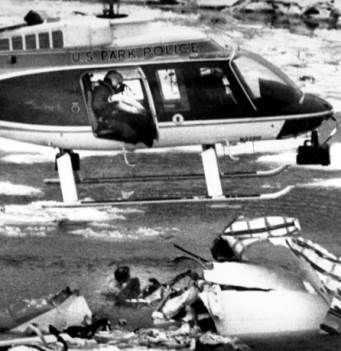 Two passengers seated in that row were never found and presumed dead; the third passenger in that row climbed back into the main cabin. 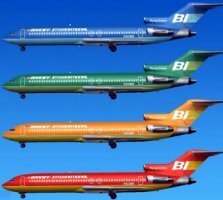 May 12, 1982 - Braniff International Airways suspended operations and filed for protection under Chapter 11 of the bankruptcy code. June 30, 1982 - With the acceptance of the ARTS II at Bismarck, ND, the delivery of all 84 ARTS II systems was complete. 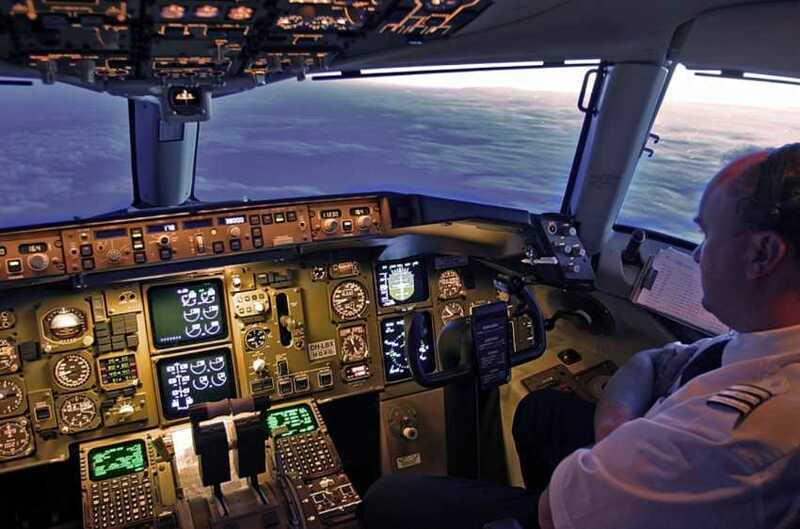 July 2, 1982 - The Professional Air Traffic Controllers Organization filed a request for liquidation under Chapter 7 of the Federal Bankruptcy Act. 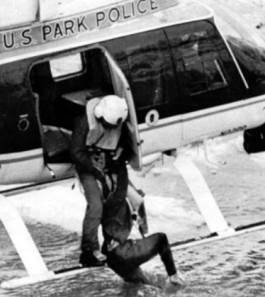 The union had about $5 Million in assets but owed $40 Million, including $33.4 Million to the airlines for violating a 1970 Federal court anti-strike injunction. After filing to liquidate under Chapter 7, PATCO's president Gary Eads declared: "It is over for PATCO. The union is gone." 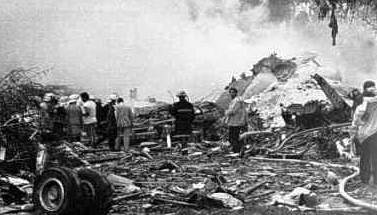 July 9, 1982 - New Orleans, LA - Pan American World Airways B-727 crashed on takeoff at New Orleans International Airport when encountering severe wind-shear and crashed into a residential neighborhood. A heavy rainstorm caused the windshield wipers to drag. Flashes of lightning were seen from the towering thunderclouds and gusty winds over 20 mph and an outside temperature of 90 degrees. A New Orleans air traffic controller advised another approaching aircraft of low level wind-shear in all quadrants, and provided relevant wind directions and speeds. 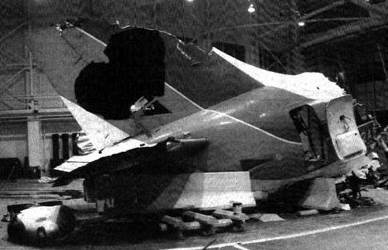 The NTSB determined that the probably cause of the accident was the jet's encounter with a microburst-induced wind shear during the liftoff, which imposed a downdraft and a decreasing headwind, the effects of which the pilot would have had difficulty recognizing and reacting to in time for the aircraft's descent to be stopped before its impact with trees. August 11, 1982 - Pan American B-747, on a flight from Tokyo to Honolulu, Hawaii experienced an explosion when a bomb hidden under a seat cushion detonated. The explosion killed a 16-year old Japanese boy, injured 15 others, tore a hole in the floor and damaged the cabin ceiling and overhead luggage bins. Despite the damage, the B-747 made a safe emergency landing at Honolulu with no further injuries. A terrorist for the Liberation of Palestine was blamed for the attack. August 31, 1982 - The agency certificated the Boeing B-767 (375 passengers), short-to-medium range, wide-body, twin-engine jet with a range of over 6,000 nautical miles. United Airlines placed the first B-767 in service. October 23, 1982 - ARTS III-A - The first fully functional ARTS III-A, including Conflict Alert was commissioned at the Seattle-Tacoma, WA (Sea-Tac) Tower. December 20, 1982 - FAA issued a request for proposals (RFP) for the initial phase of the program to acquire a new "host" computer to replace the IBM 9020s at its en route centers. 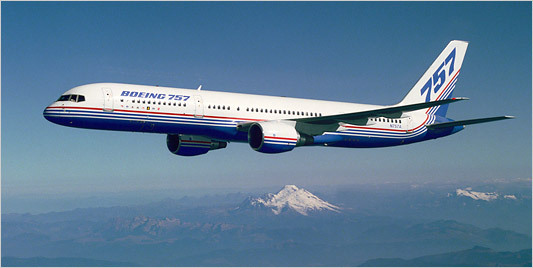 December 21, 1982 - FAA certified the new mid-size Boeing B-757 (289 passengers), a narrow-body, medium-haul twin jet. Designed to replace the B-727 on short and medium airline routes, the B-757 has a range up to 4,000 nautical miles. 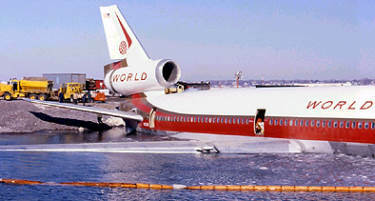 The B-757 was the second Boeing airliner with foreign-made engines (two Rolls-Royce 535C engines). The first Boeing jet with foreign-made engines was the B-707-420 which had Rolls-Royce Conway engines. Eastern Air Lines and British Airways placed the first B-757s in commercial service. 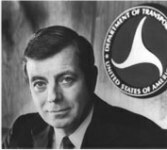 December 28, 1982 - The Secretary of Transportation, Drew Lewis, announced his resignation, effective February 1, 1983. Lewis returned to private life and became chief executive of a cable television company.